Because my mother always made them. Because my neighborhood bakery's version is a cement brick. I hate to make a batch because I only want one or two...but what are you gonna do? Cardamom, cinnamon, all spice, cloves, nutmeg, citron and currants. You could send some to me? I would gladly take a few! Would love to, but I'm a bread snob. It's my take that all breads are delicious in their first 6 to 8 hours of life but after that should be relegated to croutons or bread pudding. Those do look (and sound) perfect. You know, I've never had a store-bought HCB that I thought was worth a damn. Why do they all mess it up? Captive audience? People who want them out of tradition but don't particularly care what they taste like so long as they are sweet, that is. Kind of like people who buy matzo (except the sweet part). Agree to great extent. They are only made and sought once a year, and probably only purchased one time at that. I always forget how bad they are. My mother's? We probably demolished them while they were indeed hot and certainly while hours fresh. But that doesn't explain why most bakers can't turn out a decent product. Perhaps they are just very perishable, low in fat and sugar, and tend to stale more quickly than cinnamon rolls, morning rolls, sticky buns, etc. FWIW, I've had two of this batch, my fill for (at least) a year. Still too sweet for me. Maybe they were never really that good. Tradition is a tough taskmaster and memory is fickle. I'll take some off your hands. I'll have to eat them before Friday night anyway. N grew up with buns with the dough cross in the center, so she doesn't get the ones here with icing crosses. N is correct, what is that icing nonsense? British Empire and former colonies say no. 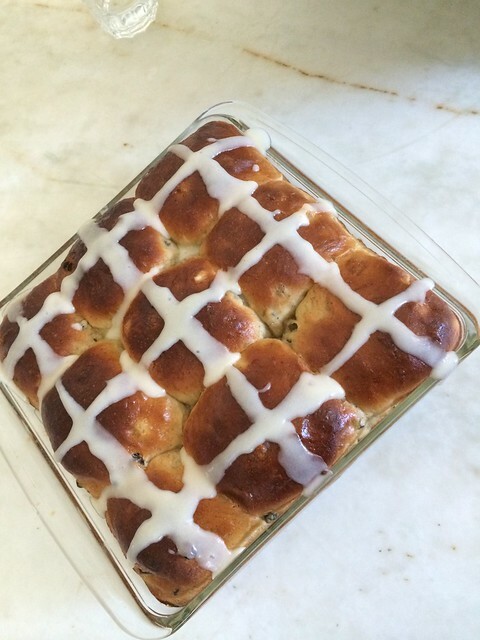 The HCB of my childhood had a "custard" cross, not icing. I don't know how to make it, nor have I found a recipe, Out of sloth, I used frozen leftover vanilla frosting, admittedly wrong. Otherwise, I used this recipe from the back of a vintage Beatrix Potter edition. At least culturally appropriate. I think the last time I ate hot cross buns was in the French pub in London's Soho, one Easter Sunday morning, ten or more years ago. The owner brought a bag in for bleary-eyed drinkers. I don't know when I last ate a currant bun.